Nova Scotia pewter artist May Ocean is seeking to appeal a recent Nova Scotia Supreme Court ruling that found her partly to blame for a two-car collision near Whites Lake, about 25 kilometres south of Halifax. Ocean’s notice of appeal, filed on June 28, is the latest twist in a decade-long legal battle that was the subject of a Coast cover story in 2009. Ocean is asking Nova Scotia’s Court of Appeal to overturn the lower-court ruling and declare Raymond Patrick Sullivan fully to blame for the accident which wrecked their two cars and injured both of them. During a 25-day trial last fall, an accident reconstruction expert testified that Ocean had no way of avoiding the collision which happened after Sullivan came barrelling around a curve 110 metres (about 350 feet) from where she had already pulled onto the highway. Even though Sullivan slammed on his brakes, the expert testified his speed at impact was likely around 91 kilometres-per-hour in a 70 kph zone. In her ruling released on June 1, Supreme Court judge Deborah Smith accepted the expert’s findings. However, she found that Ocean contributed to the accident by choosing to pull out of a store parking lot at a spot which gave both drivers less time to avoid the collision. She assigned Ocean 20 percent of the blame ruling that Sullivan’s excessive speed made him 80 percent responsible. 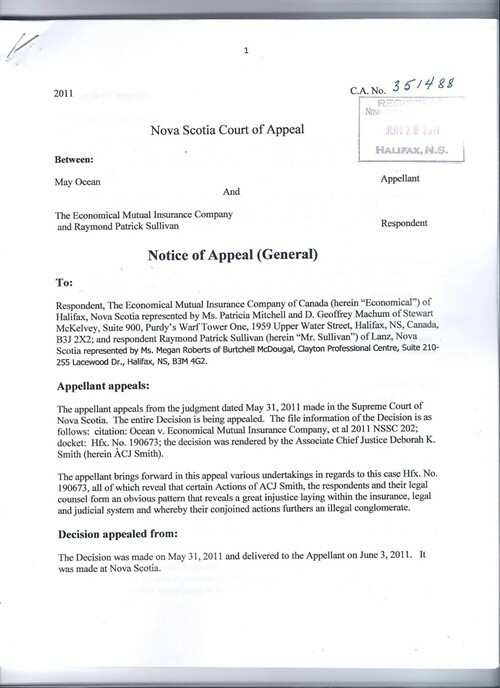 In her notice of appeal, Ocean claims the judge “continues to hold an unfair prejudice against me by having stated that she considers me to have been ‘confused’ about where in the store parking lot I had pulled out from.” Ocean, who represented herself in court, testified she exited the lot at the safest possible location. At the time of the accident on December 13, 2000, Sullivan carried no car insurance. That meant Ocean had to depend on her own insurance company, Economical Mutual, for coverage. In her notice, Ocean asks the Appeal Court judges to declare that the company showed negligence and bad faith in handling her accident claim. Her appeal also seeks monetary damages against the company as well as full reimbursement of the thousands of dollars she has spent so far on her lawsuit. Ocean contends that insurance companies, their lawyers and the courts “work to uphold a corrupt Insurance System” that victimizes car accident victims. She lists a number of people who, in her case, worked to uphold that system. They include two psychiatrists, the accident reconstruction expert, a politician, her previous lawyer and journalist Bruce Wark.